Copy, Paste the formatting. Please don't forget to remove the spaces! Essays: Pretty darn good. Wrote abstractly about my hobby of doing puzzles. Teacher Recommendation: Really good... Both teacher loved me, don't really know why. Counselor Rec: Read it! Talked a lot about my high level classes and my bunch of service hours. Great. Additional Rec: Good! From the people I nannied for... They asked to adopt me like every day (as a joke). Interview: It went really well! I loved the admissions counselor for my region. Why you think you were accepted/waitlisted/rejected: I showed a lot of interest! It was my number one choice and I was pretty qualified I guess. AP (place score in parenthesis): AP Government (5), AP Lang. & Comp. (4), AP United States History (4). Senior Year Course Load: AP European History, AP Literature and Composition, AP Economics (Micro+Macro), AP Biology, and AP Psychology. Extracurriculars (place leadership in parenthesis): Polish Cultural Society (Vice-President), Economics Club (Treasurer), Federal Reserve Challenge, Chess Club, and several other things. Job/Work Experience: Worked for several political organization. Volunteer/Community service: Over 100 hours of volunteer work. Summer Activities: Attended most prestigious summer-program in state. Essays: I think both my Common App essay and my supplement were very strong, and I worked meticulously in ensuring they stood out. Teacher Recommendation: Both were excellent, 5/5. Counselor Rec: Didn't have one. Additional Rec: Recommendation was from a former Princeton Professor. It was excellent. Interview: Interviewed on campus, went very well! Income Bracket(mention if FA candidate): >40,000. Strengths: GPA, extracurricular activities, work experience, essays, and demonstrated interest. Weaknesses: SAT scores were not the strongest, and could have taken SAT IIs. Why you think you were accepted/waitlisted/rejected: A lot of demonstrated interest. Overall, I think I really "fit" the student model GW was looking for. Where else were you accepted/waitlisted/rejected: Rutgers University (safety). 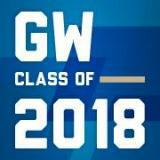 I never applied anywhere else since GW was my first-choice. General Comments: I got excellent financial aid, and I'm very excited to be attending! Essays: I'm real good at writin'. I made them all pretty witty, wrote my SMPA essay about Hillary Clinton and my admissions counselor told me she loved it. Teacher Recommendation: Really good, I assume? I'm pretty sure one was pretty generic and the other was on a more personal level. Counselor Rec: Didn't read it, and I don't really know her (I go to a pretty big school), but I'm sure it was okay. Additional Rec: This is the only one I read and it was really good. My mom's friend is a college prof and helps me write papers and stuff so he wrote a great one. Interview: Mine went really well. It didn't even feel like an interview; we mostly talked about my interviewer's daughter who is a GW student. Where else were you accepted/waitlisted/rejected: Accepted to University of Alabama, and that's it! General Comments: Super excited! Good luck to everyone else!